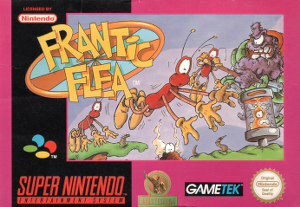 Frantic Flea for Super Nintendo has you save your flea friends from the Evil Insideos that are taking over your homeland. You can utilize many of the devices that are situated throughout the world including the Hoverpad, which allows you fly; and the Stikko, which gives you the ability to climb the walls and stick to the ceiling. Play through six different environments.